Mike Brewer, Tom Shipley, a couple of coutry boys (Mike from Oklahoma, Tom from Ohio). Two very gifted singer/songwriters, they personified the 'back to the land' movement of the late '60s, early '70s, in songs like "When Everybody Comes Home" and "Shake Off The Demon" combining the earth lover sentiments of the latter tune with a real gospel ferver. One toke over the line...."
Almost anyone who has ever considered him or herself a member of the counter-culture will remember those lines. Such an uptempo, gentle, happy song - which stirred up controversy! Yet stir up the airwaves it did, bringing Brewer & Shipley to a national fame and/or notoriety depending on which side of the Revolution you were on. They exemplify gentle protest - just two guys with guitars - managing both to convey a MESSAGE (like these lines from "Rise Up, Easy Rider"
And a bullet makes him dead"
Come on don't you start to fight me. Just don't fit the shoes"
from "Oh Mommy", just one of their outrageously satirical political/sociological commentaries - songs which poke fun both at the Powers That Be and themselves. When they choose to interpret tunes of other writers like Dylan ("All Along The Watchtower") and Jackson Browne (The uplifting "Rock Me On The Water"), they chose hope and a good melody as their vehicle of expression, rather than anger/violence. Their love of songs are something else! Full of poetry, light, life...listen to "Ruby On The Morning" and "Lady Like You", not to mention the bittersweet truth of "Yankee Lady" and you will find genuine feeling, plus a real look at the roles of man/woman in today's mixed up world. 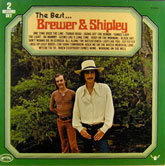 Brewer & Shipley....troubadors of today's America, its highways, its country, its politics, youth, love. Their music is haunting, folksy, strong, satirical, melodic, pertinent, committed....these are all just words...listen for yourself to THEIR words and music in the this Two Record Set "The Best of....Brewer & Shipley". You'll agree they ARE the best!